Toni mentioned that he would do a long training ride for ITI and sleep at a shelter. I expressed interest in joining him at the shelter and suddenly a choir of "me to" could be heard. 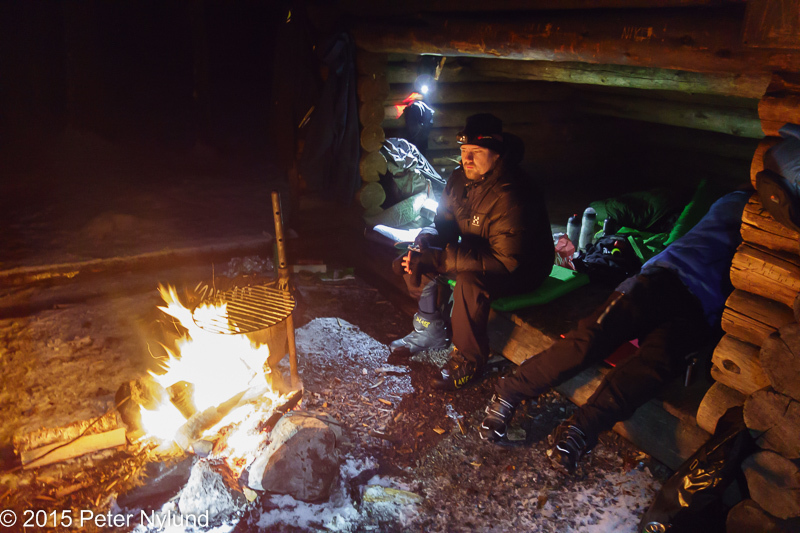 Finally six of us were to go to the shelter at Lakjärvi. 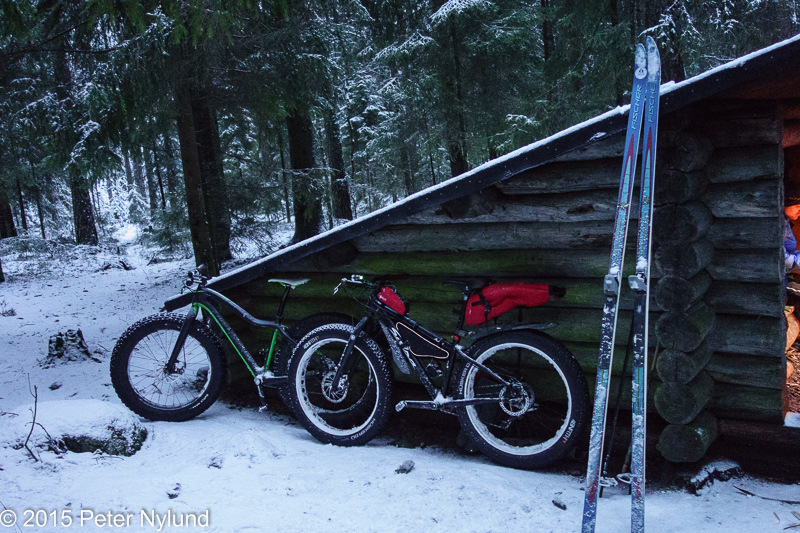 I did originally intend to go there by bike, but a week ago we again got enough snow to call it a winter and I decided to go on skis instead. 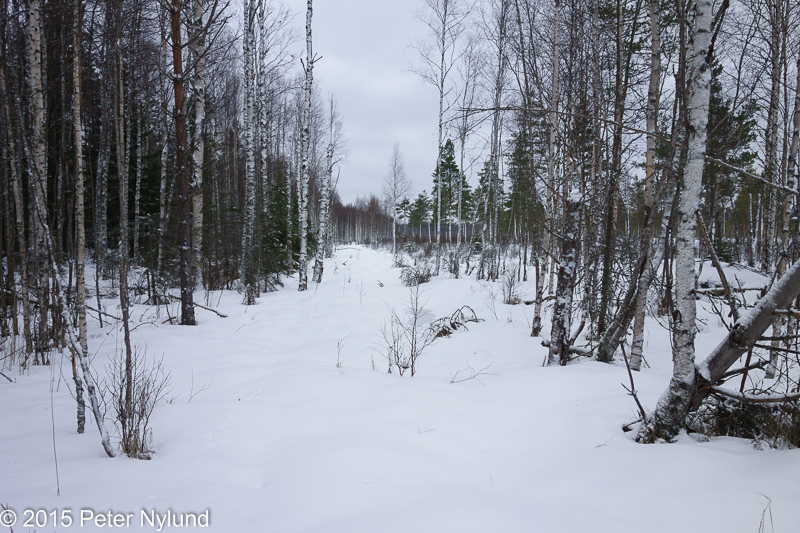 During the week the weather turned from miserable to worse in Turku and currently we have only enough snow to keep the ground white. 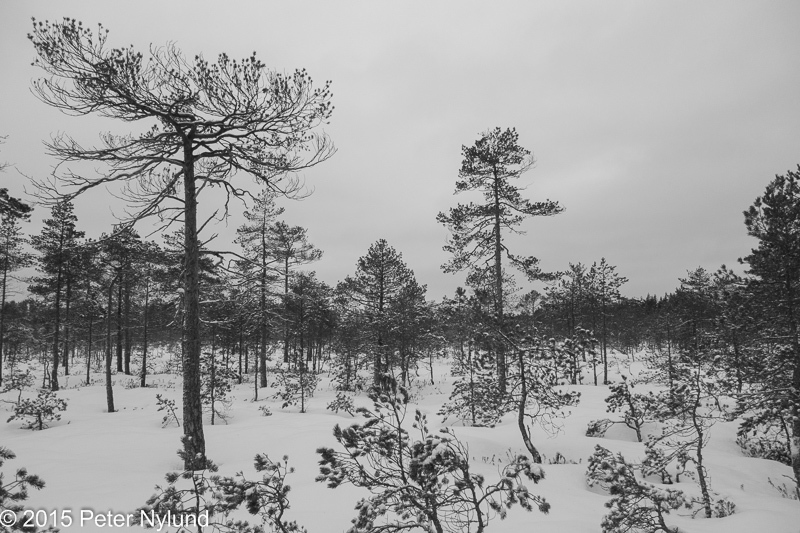 After some reports I had some hope that the situation would be better in the Kurjenrahka National Park about 25 km north of Turku. 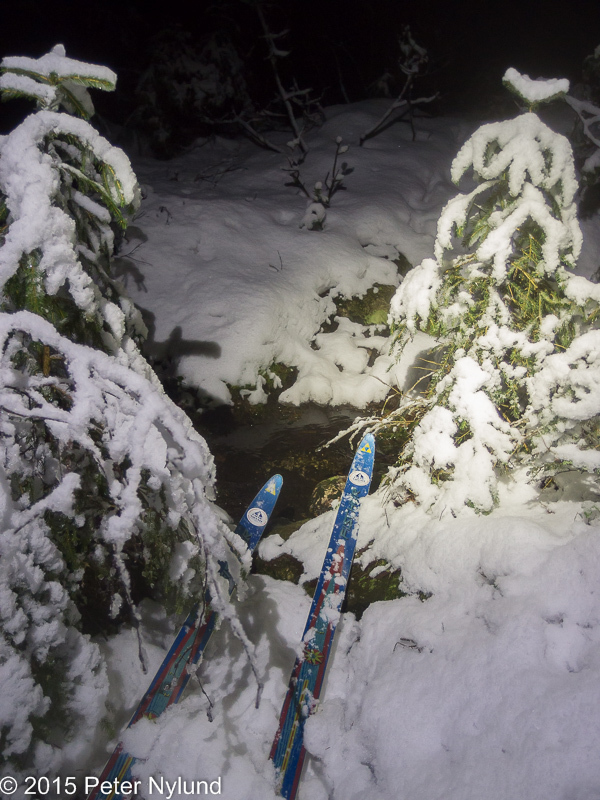 I still was prepared for some real extreme skiing on slush on wet and bottomless mires, though. It was a pleasant surprise when there was a real winter at my starting point. 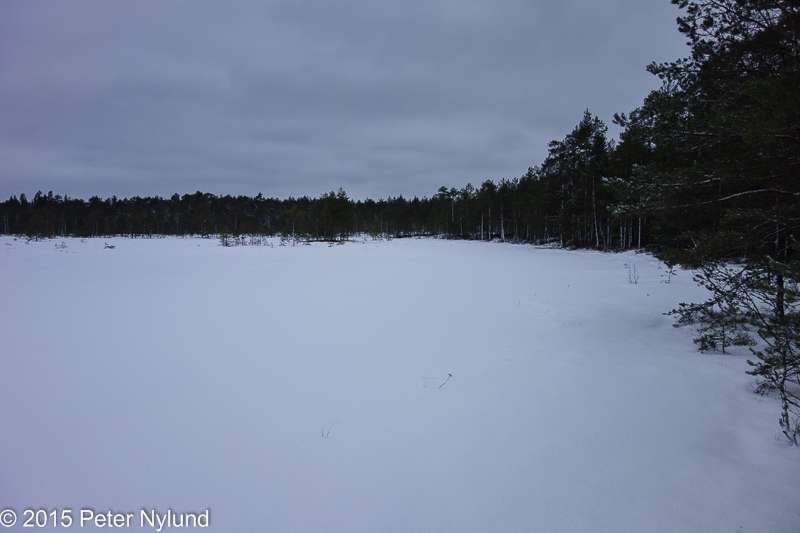 I had planned to ski about 7 km of the larger mire ring route, from Kiikonkylä to Lakjärvi on the open mires. I've only once found a good route through the first section and this time I decided to try the forest next to the mire, which was a big mistake. 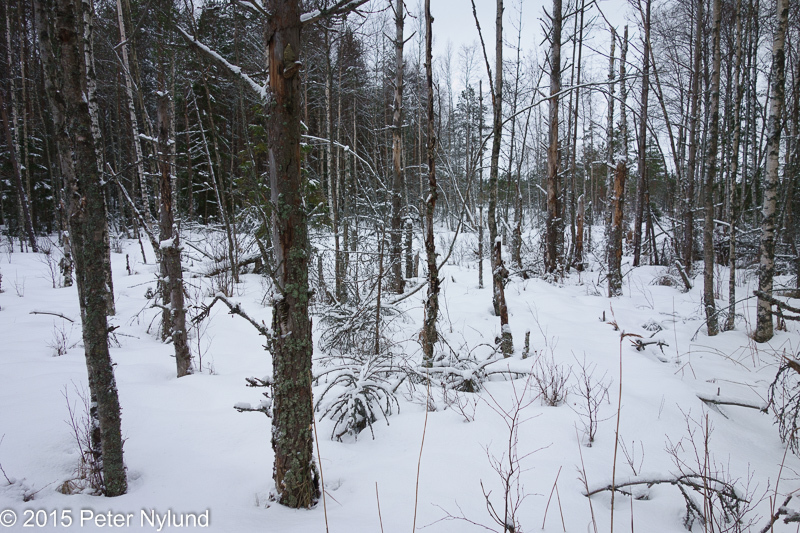 The forest became very dense and it was very hard to keep the direction. Almost every time I checked the compass I was again off course. 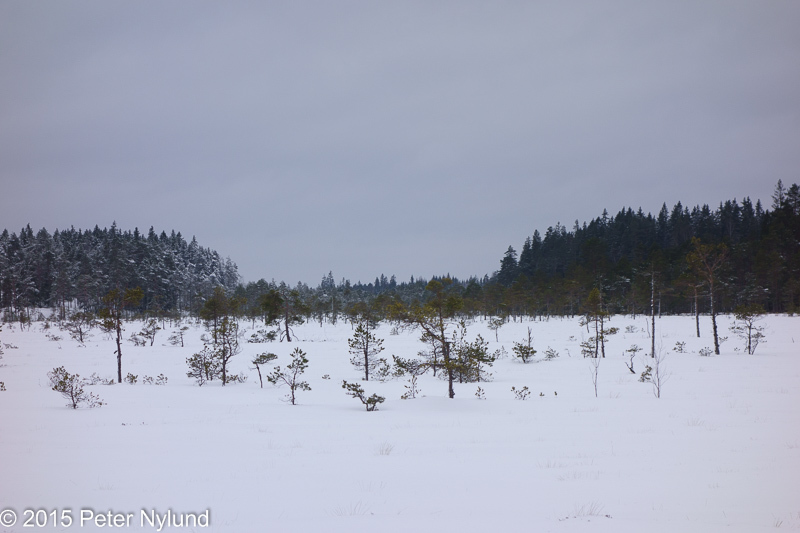 When I arrived at the open mire the navigation was again easy, but the forested parts demanded careful compass usage. 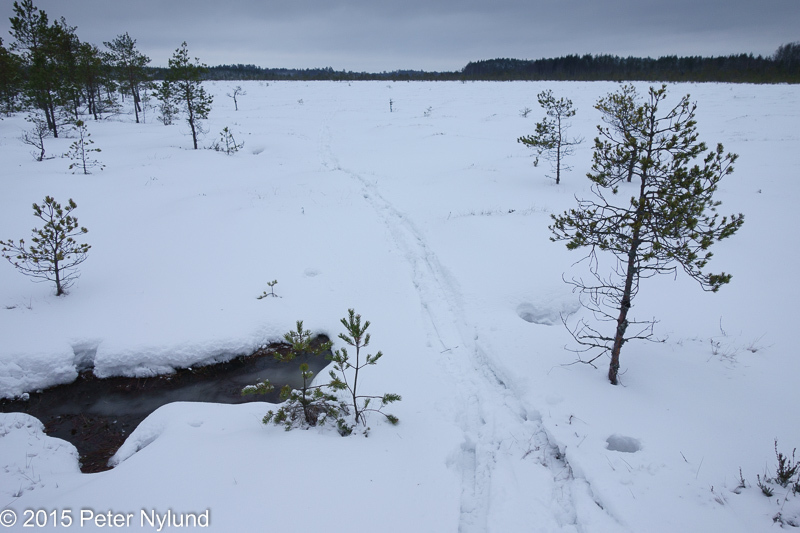 There was also no shortage of animal tracks there. 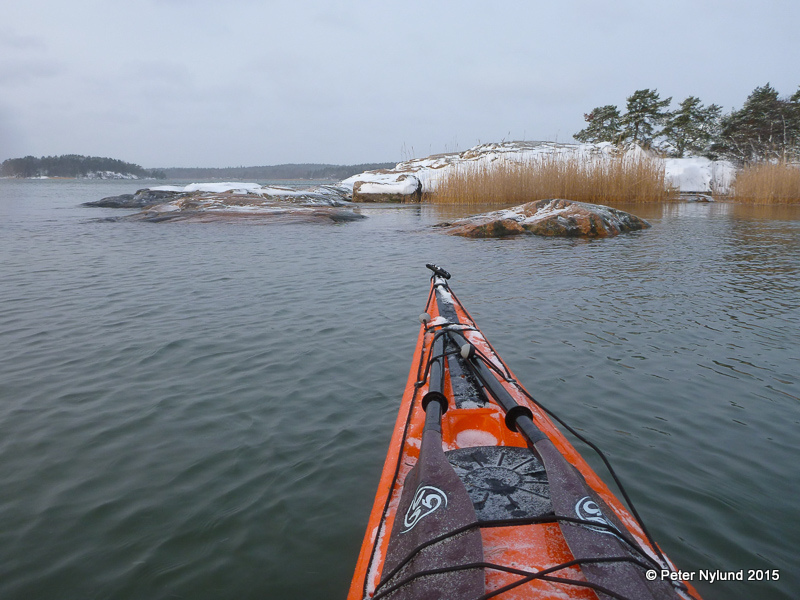 The going was very slow and it took me three hours to get to Lakjärvi. 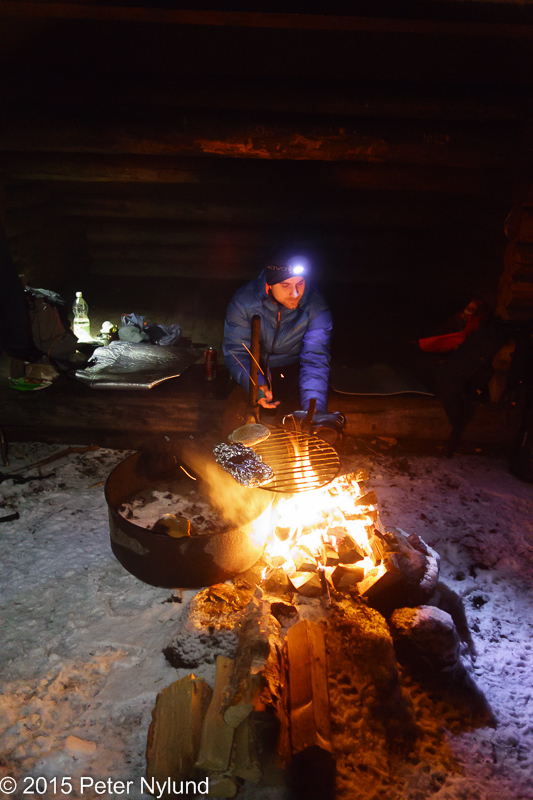 Tommi and Mika had arrived earlier by bike and lit a fire. JJ arrived at the same time as I with a bike. 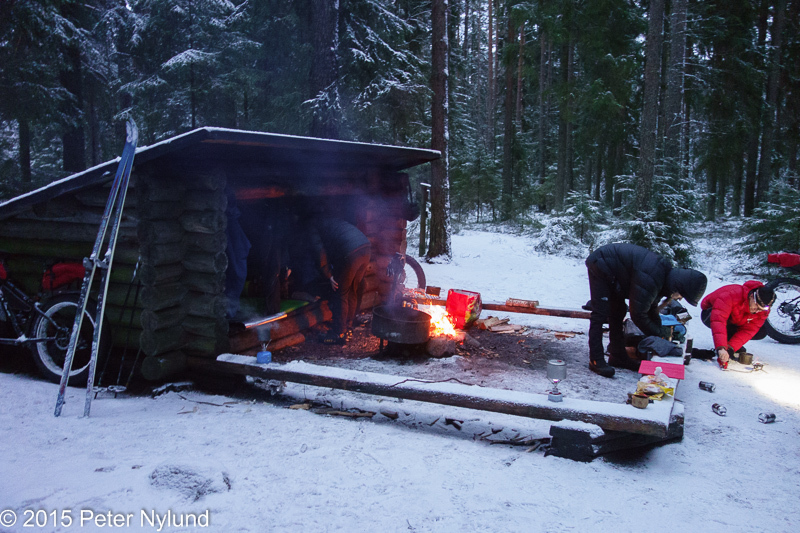 Lakjärvi has two shelters, a larger and a smaller one. The fire was at the smaller one, but we decided that the larger one would be better after all. Operation Fire relocation started. After a while Jarkko arrived. He had taken an alternative route, but I'm not sure it was on purpose. ... and making food. 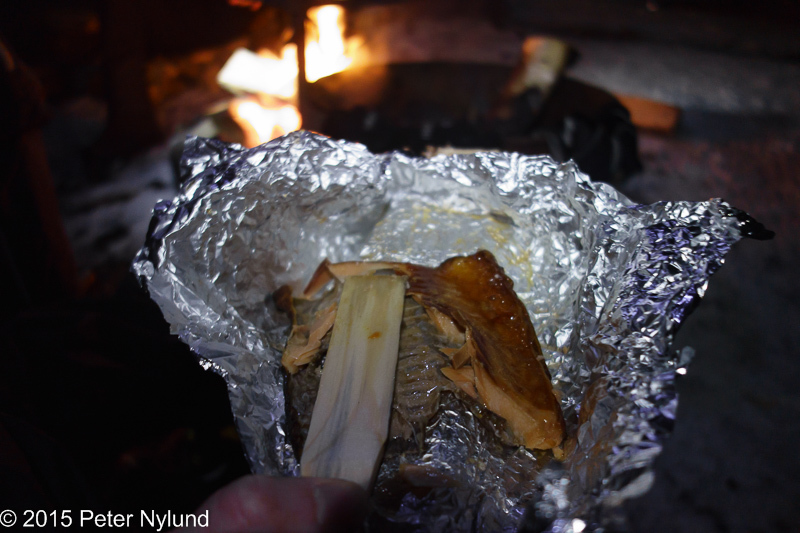 I heated a smoked salmon in addition to vegetables in a foil packet. (Yes, I forgot my fork/spoon again). I went to sleep early, around 1:30. 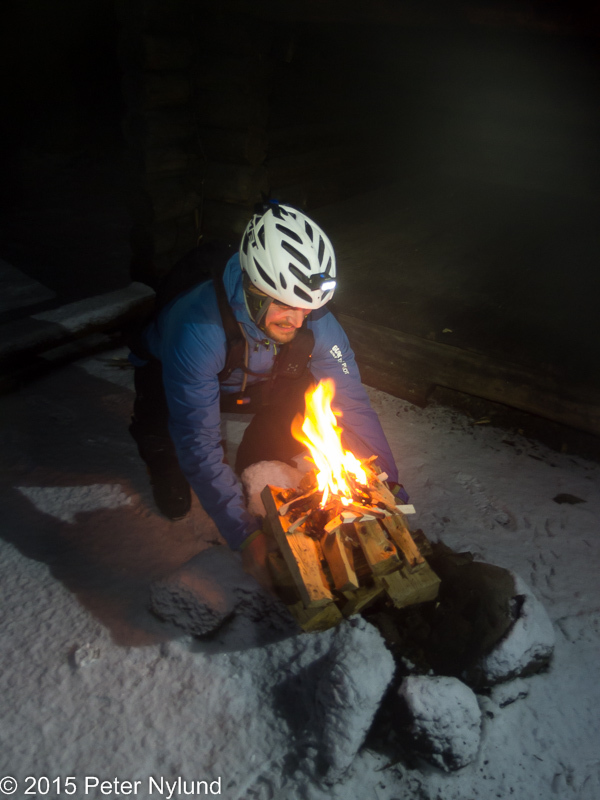 The night temperature was probably around freezing, which is a tad too much for my 600 g summer sleeping bag. With a down jacket on top I slept well, but was not warm and comfy. 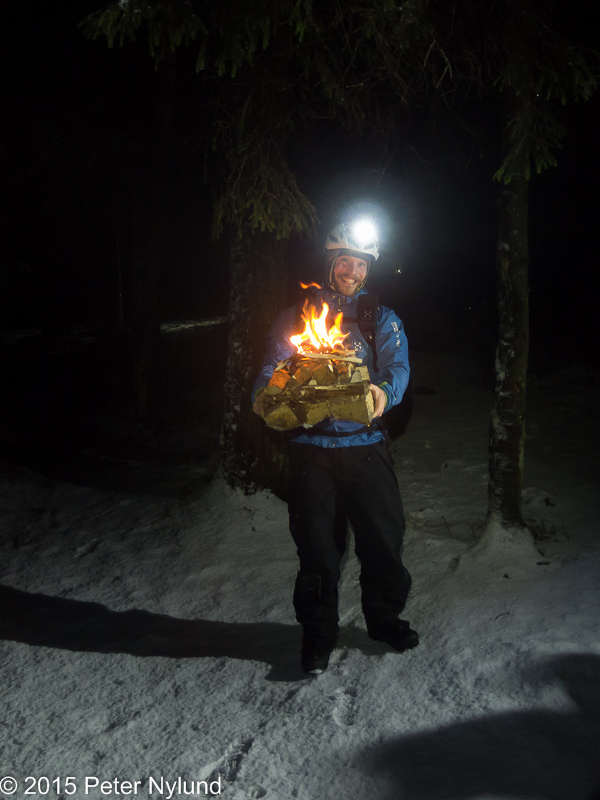 A little before eight Jarkko got the fire going and I got up. I had toasted sandwhiches and hot chocolate for breakfast. Two different means of transportation. 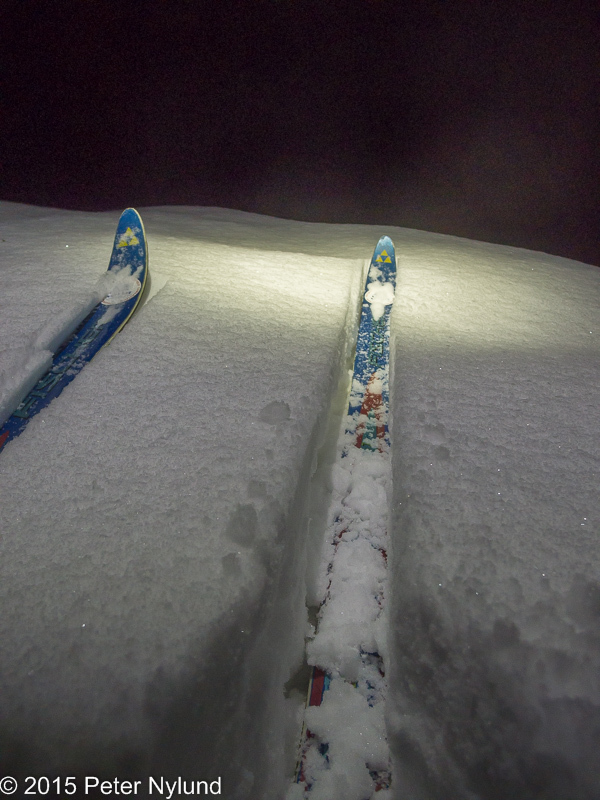 My skis are from the previous millenium and has the original Salomon SNS BC binding. 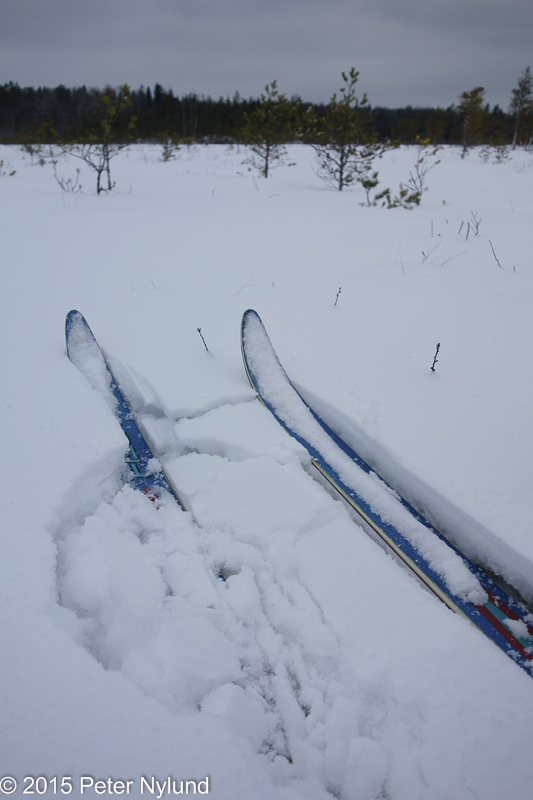 The same binding format is still in use and I have it on my forest skis as well as on my Nordic skates. Toni about to make breakfast. Jarkko has the original Pugsley. 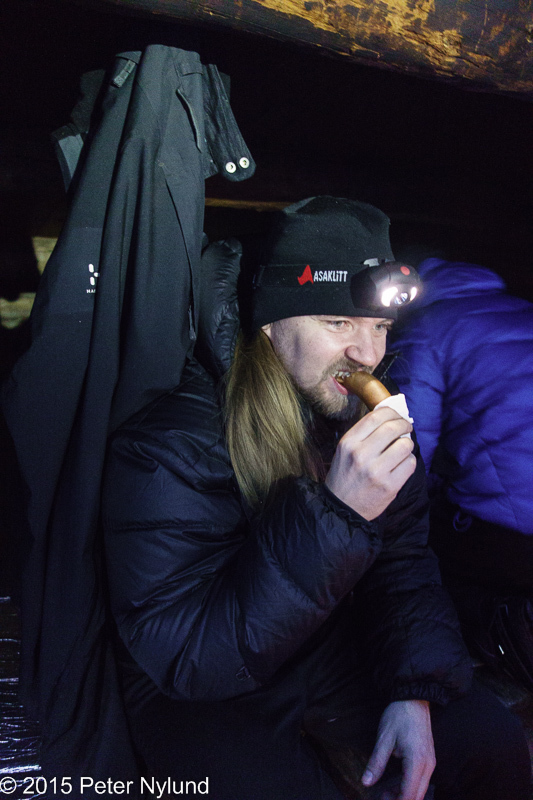 Jarkko conducts a scientific experiment: Is it possible to eat sausage for breakfast? I, for one, have always doubted it. Almost everyone is packing their stuff. On the move again. Around the shelter there was very little snow, due to the large spruces collecting everything, but otherwise there was no shortage. The mire opens up again. My tracks from yesterday. I followed them for a while. I decided to try a new shortcut. 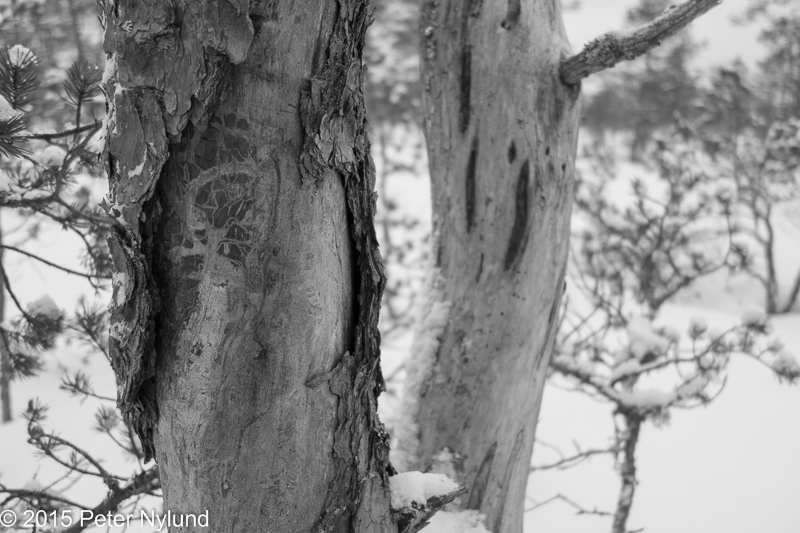 A frequently used animal trail. Out in the open again. 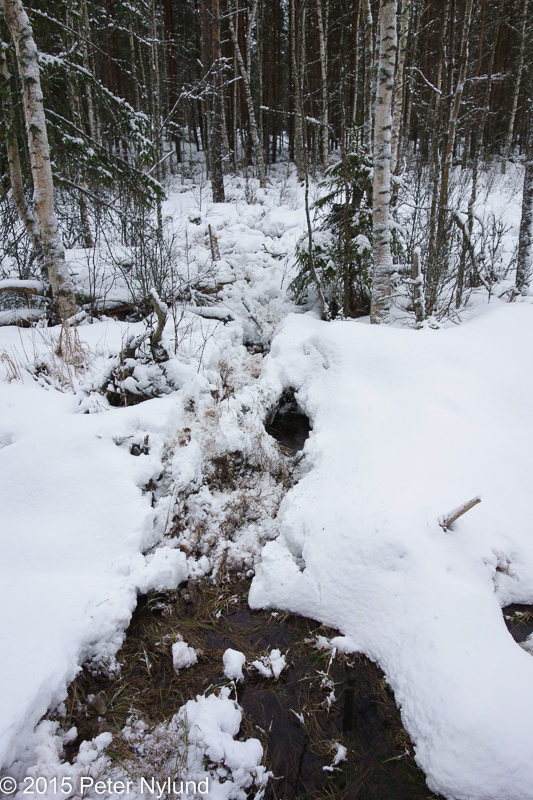 When the mire gets too many trees, seek out the lagg zone. I was a little faster this time, the 7 km took 2 h 40 min. 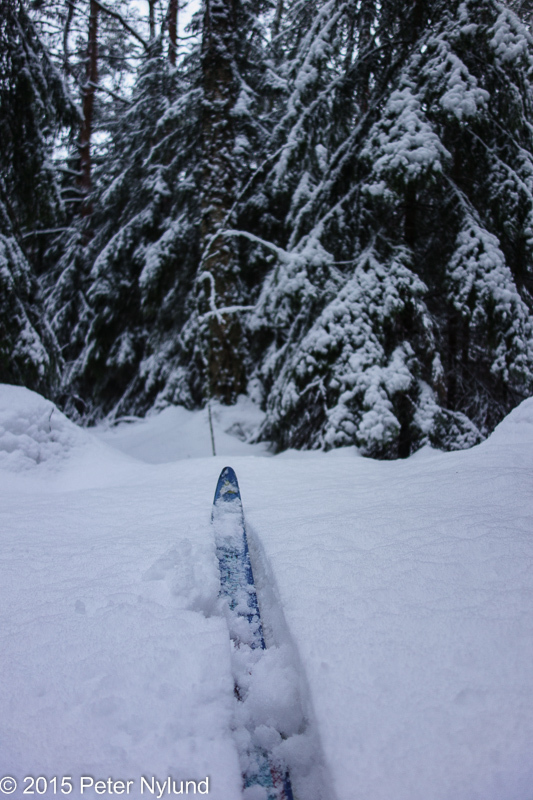 It had been really nice to be on skis again. 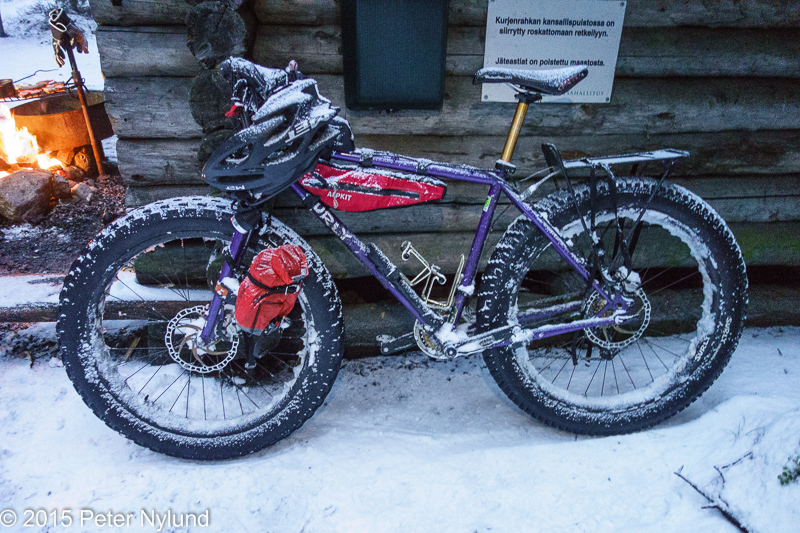 I've now had my Salsa Fargo for five years and it is time to sum up my experiences with it. Inspired by a number of bikepacking articles from the US, I ordered a Salsa Fargo XXL sized frame from Foxcomp in December 2009 and it arrived a few weeks later. January 16th I had it assembled and got to test it. I liked it. 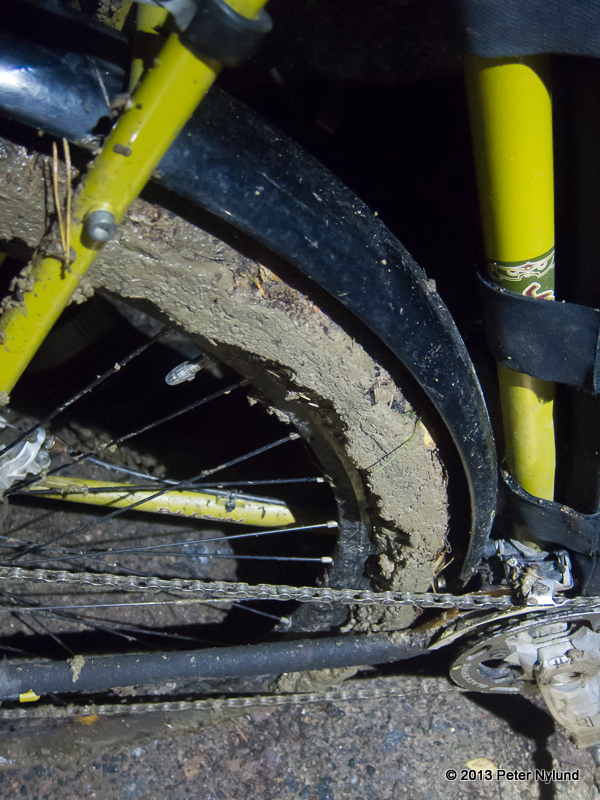 I soon made a frame bag and started taking it out for overnighters. 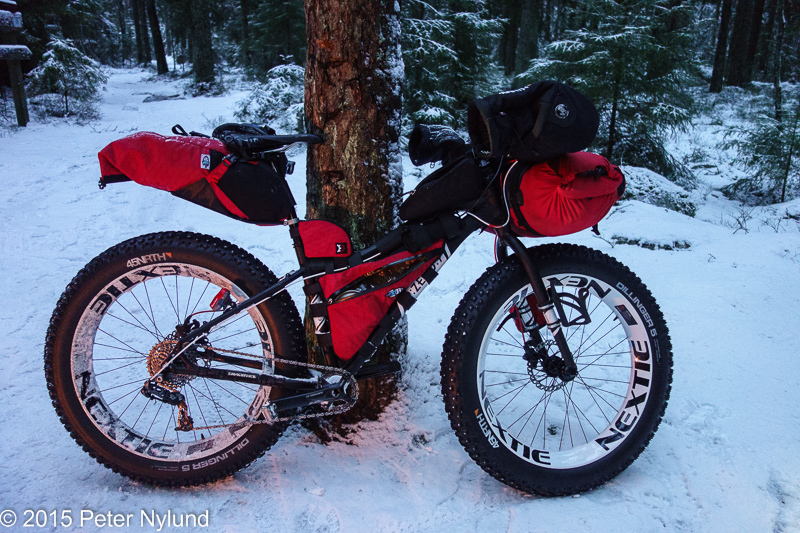 It soon became my number one bikepacking bike. Compared to my FS 29er, it offered the possibility to ride without a backpack and it was also good enough on technical trails, in addition to feeling a lot more right riding all sorts of roads. With this bike I started to return to the area where I spent my childhood and youth, sometimes I took the train there and a number of times I just rode the 100 km there on road with the Fargo. 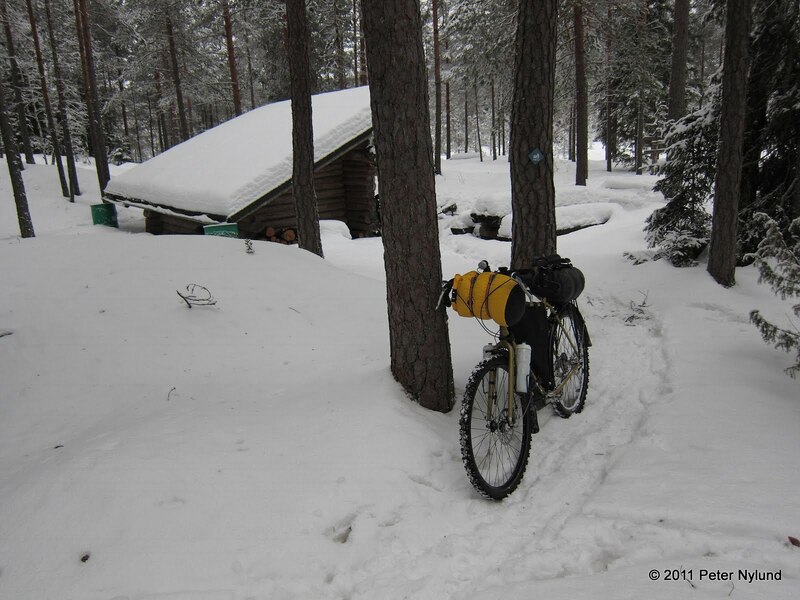 After I got a fatbike, I still used the Fargo for winter outings involving spending more time on roads. 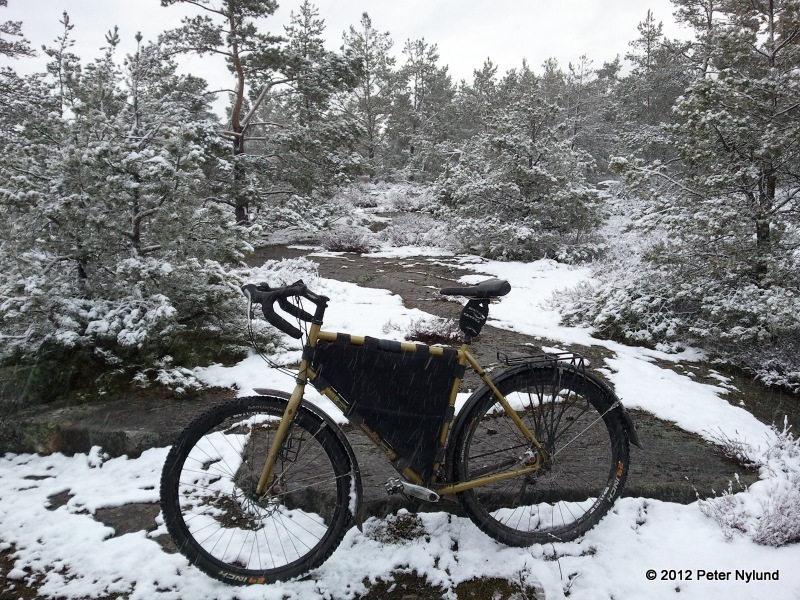 For a few years I also had a road bike, but I found that I rather took the Fargo when going out for riding roads, since it allowed me to take detours into the forest when I came upon interesting places. It has seen three Mammoth Marches. Almost daily commuting is another task it is used for. (I do have to possibility to commute on mostly trails when I feel like it). 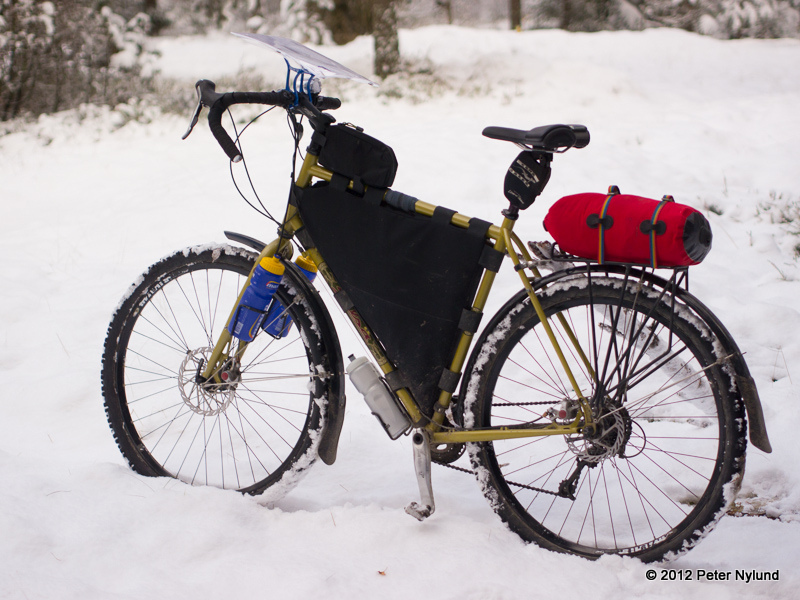 The Salsa Fargo has been an excellent bike. 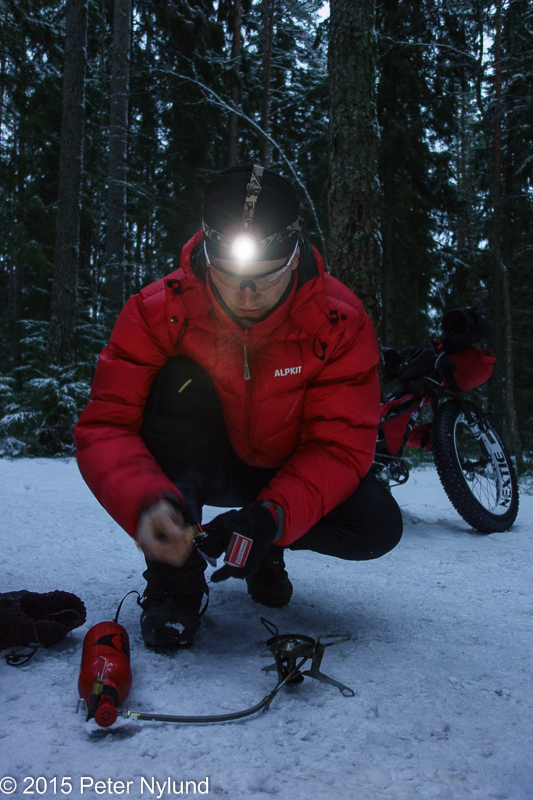 It is very versatile and is a good choice if you only want to have a few bikes. 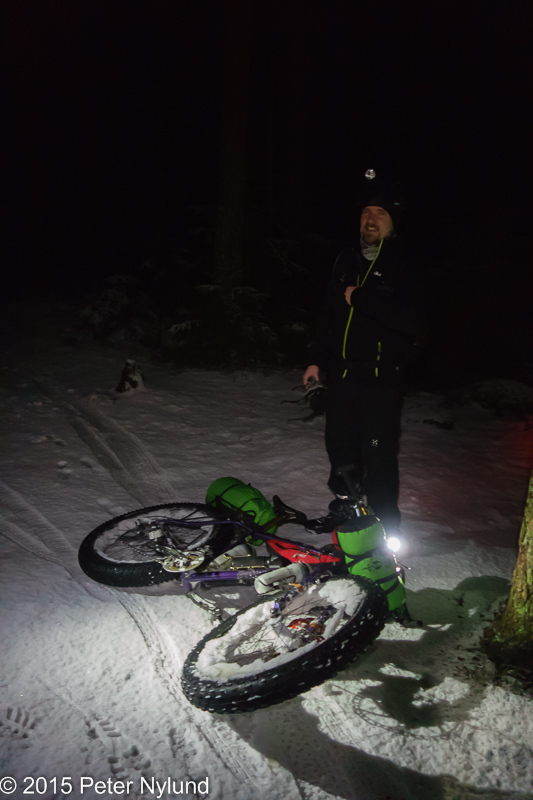 For me it has been a good complement to the fatbike, though if I could have only one bike it would be a fatbike with a separate 29+ wheelset for the summer. For commuting and everyday use a simple fully rigid bike is a good choice, since it doesn't need much maintenance. Most of the components have stayed the same for five years. 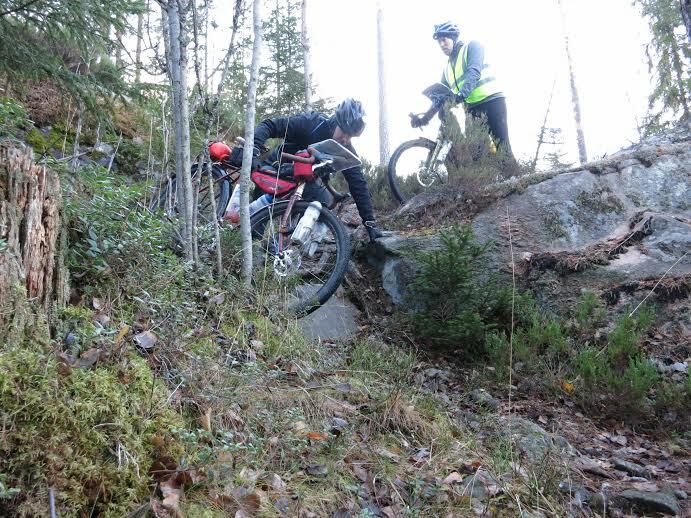 The drop bar was switched to the excellent Salsa Woodchipper as soon as it was available, the saddle was exchanged to a Rido R2 and the Avid BB5 brakes were recently switched to the better BB7 model, but otherwise it's the same (not counting worn out drive trains and bearings). All-in-all, a good five years and I see no reason why I wouldn't be happy with it for another five years. The weather continues to be unstable. 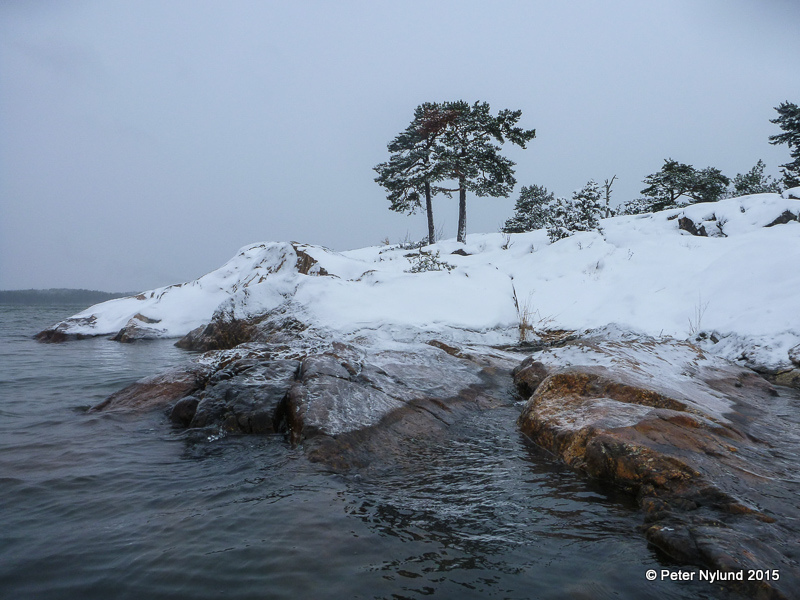 During the Christmas it was cold, and it looked like the winter was here. 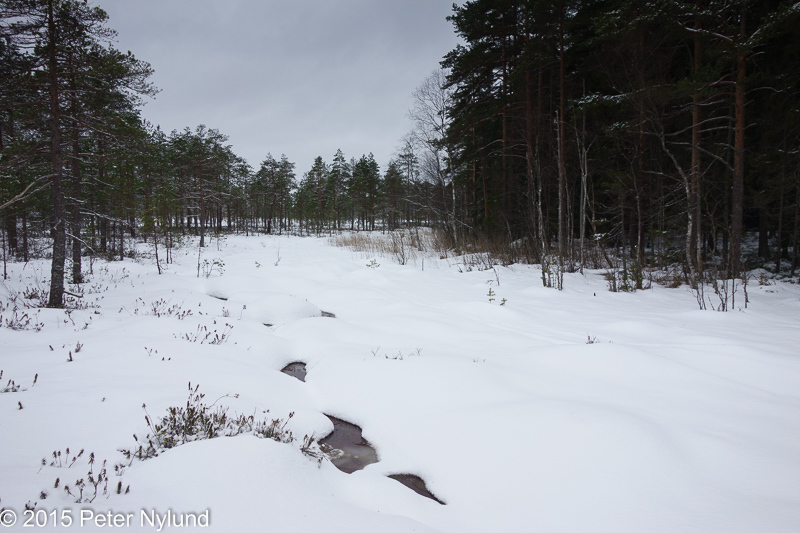 For New Year the weather became warm and rainy and the snow mostly melted. A few days later we got snow and fairly cold weather, followed by a few days of rain and warm weather. 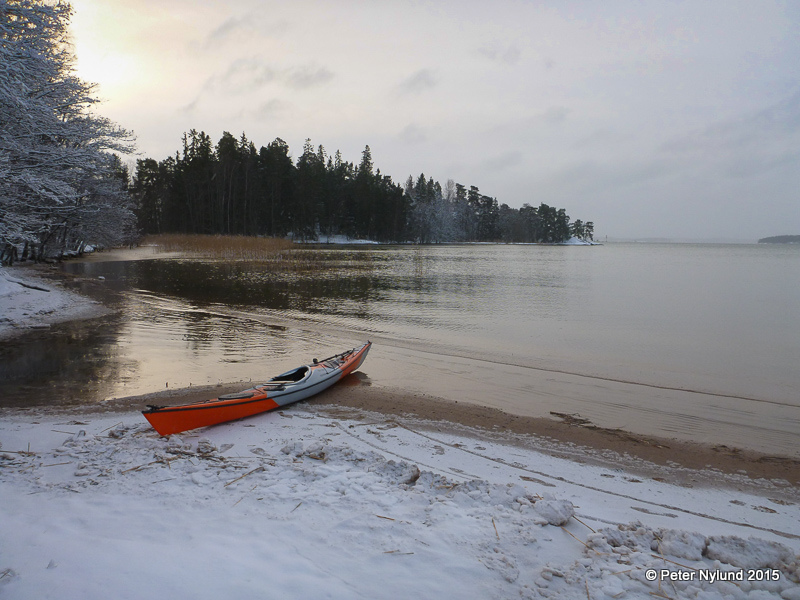 Now we again have snow and cold weather, but warmer weather is forecasted. Quite frustrating. 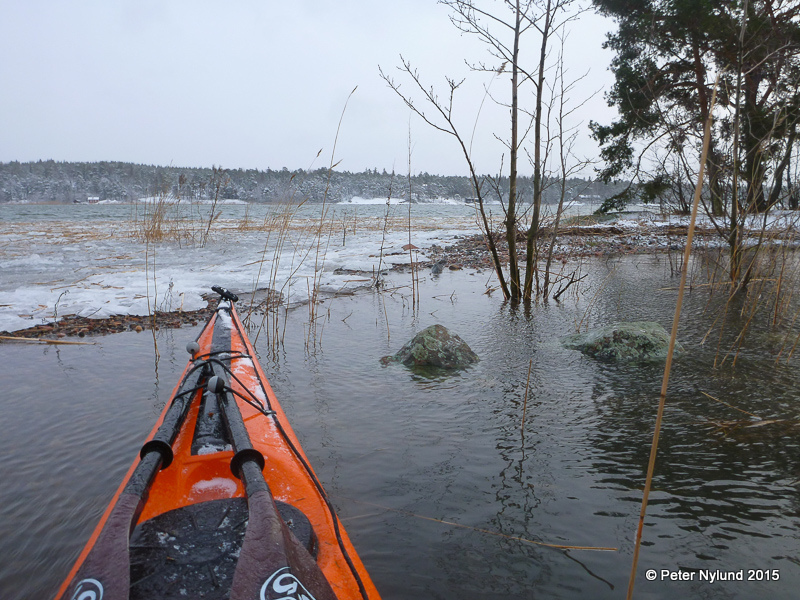 I've thought the kayaking season to be over a number of times already, but it hasn't happened yet. 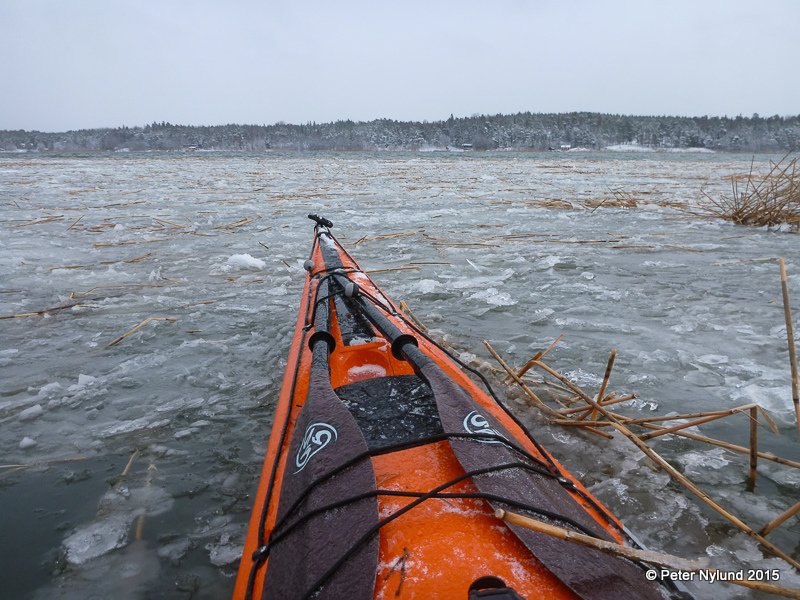 The inner bays are ice covered, but my usual starting point is still not close to getting ice, which is one parameter that defines the end of the kayaking season. 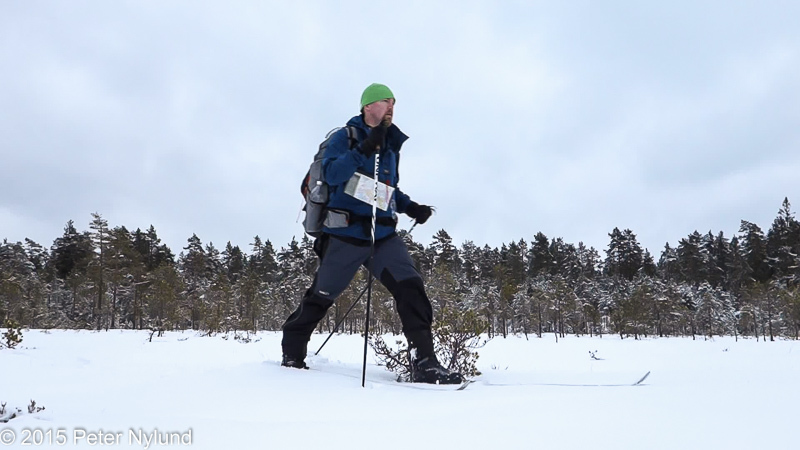 The other conditions are that the typical winter activities like skiing, skating and fatbike riding on snow should be reasonably possible. 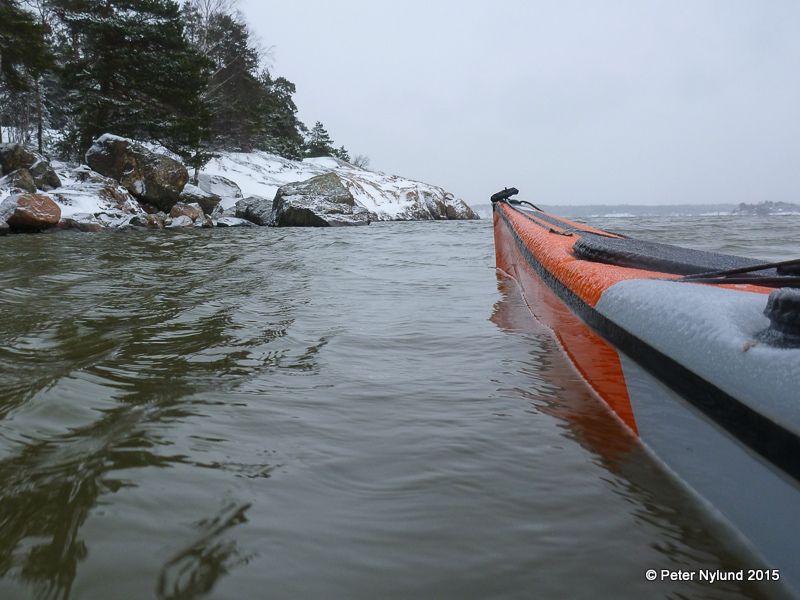 And we are not there yet and hence I went for yet another final kayaking outing. 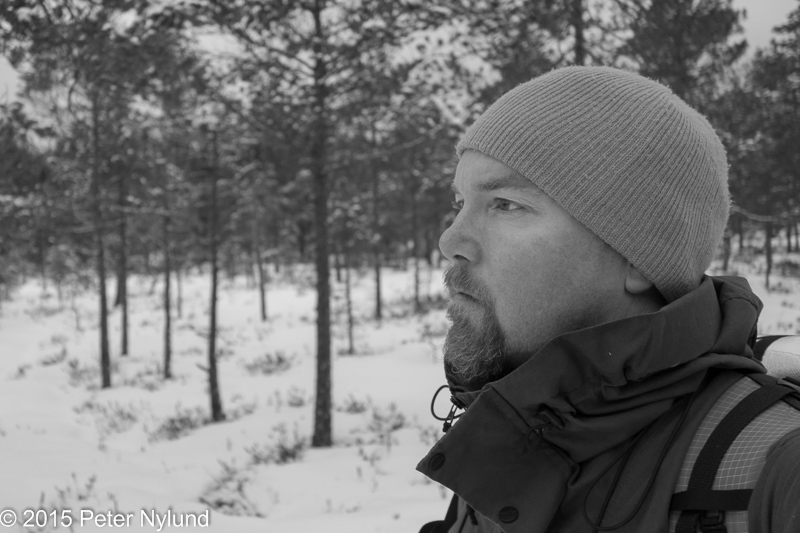 This might actually be the final one, since for the following two weekends I have Vigu courses scheduled. 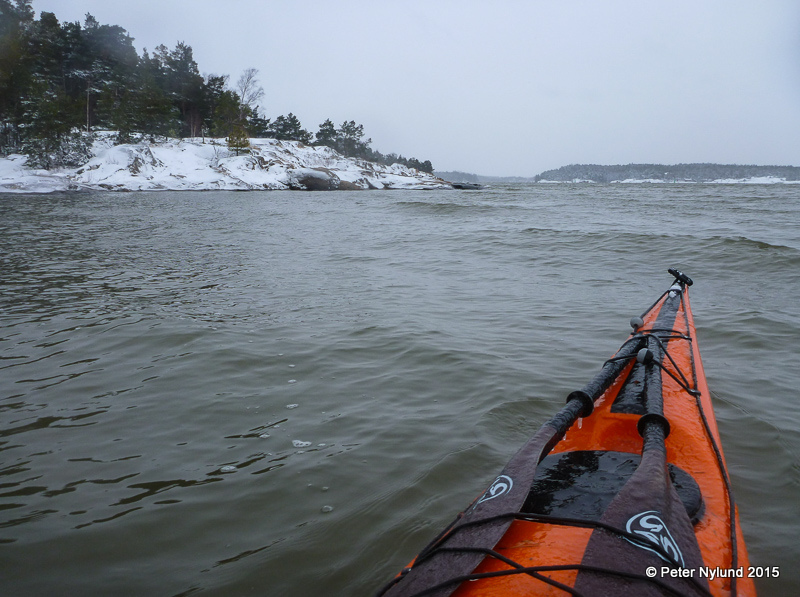 The starting place was the usual one at Ruissalo. The water level was a lot higher than normal. First I went a little to the west to check the conditions a bit after the cape shown here, where the wind would start to affect things. Fairly hard wind was predicted and the weather station three kilometers to the south recorded wind speeds of 12-13m/s in the gusts during the time I was out. 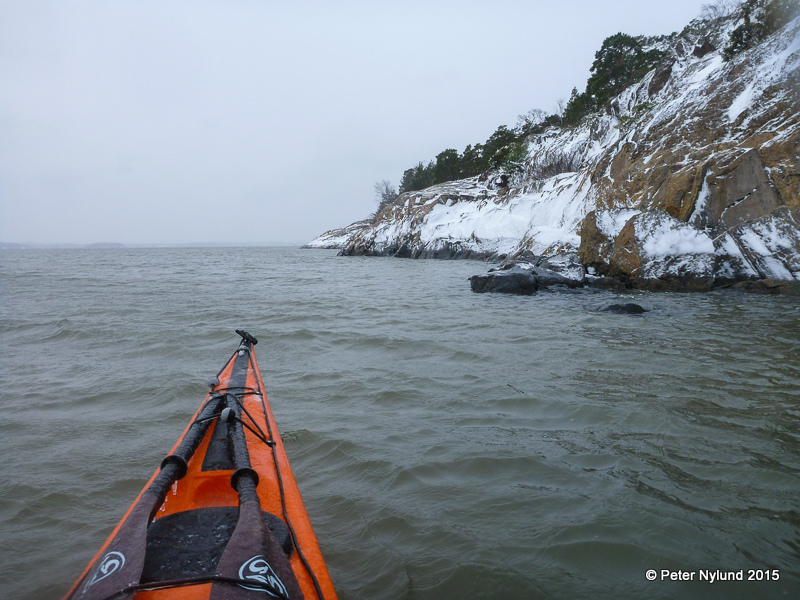 I decided not to do the crossing and instead chose more sheltered waters. 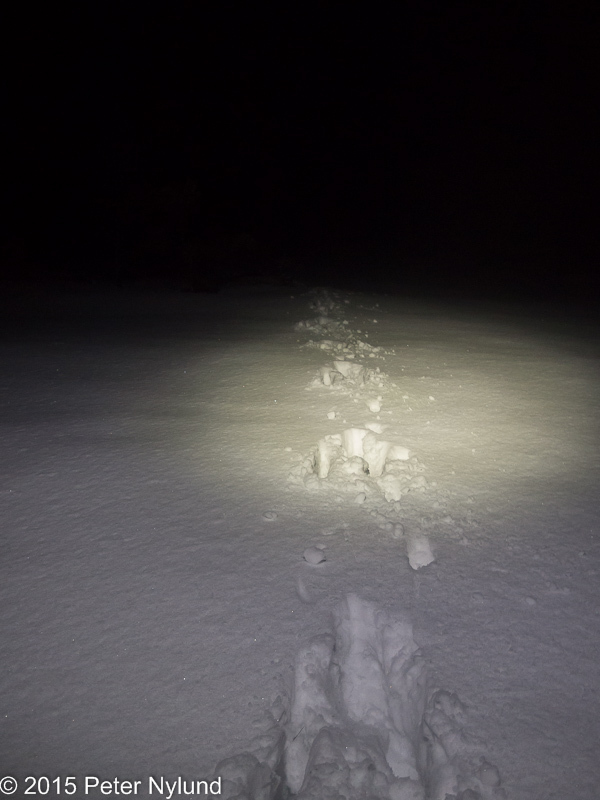 The hard wind and an air temperature of -5C is not the place to use smaller margins, especially not when being out alone. 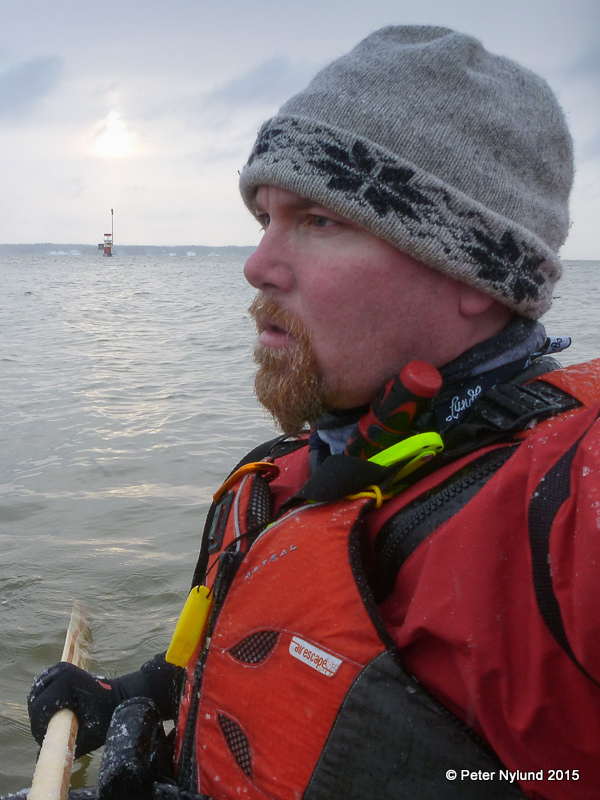 I could have gotten through, the ice didn't seem solid, but it didn't seem smart, since e.g. 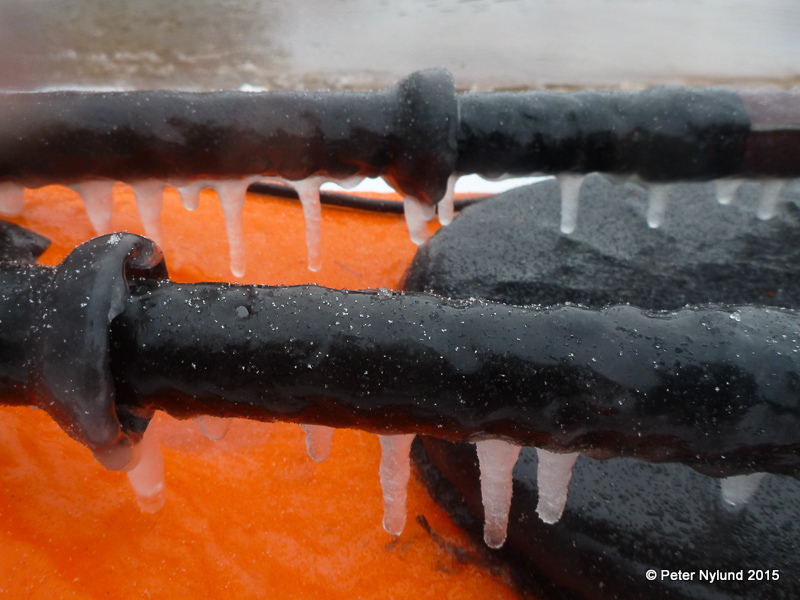 bracing isn't possible, should the need arise. 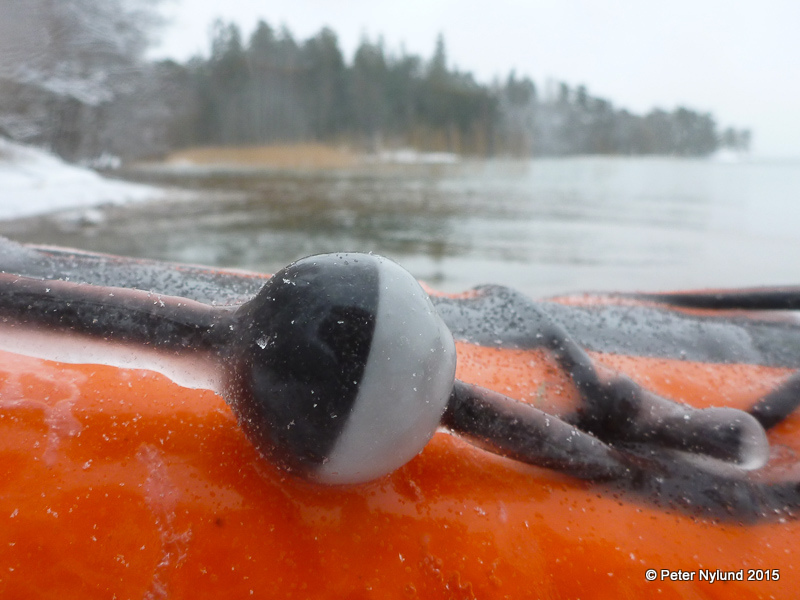 The water level was 60 cm above normal. I continued a while until I run out of wind shelter. 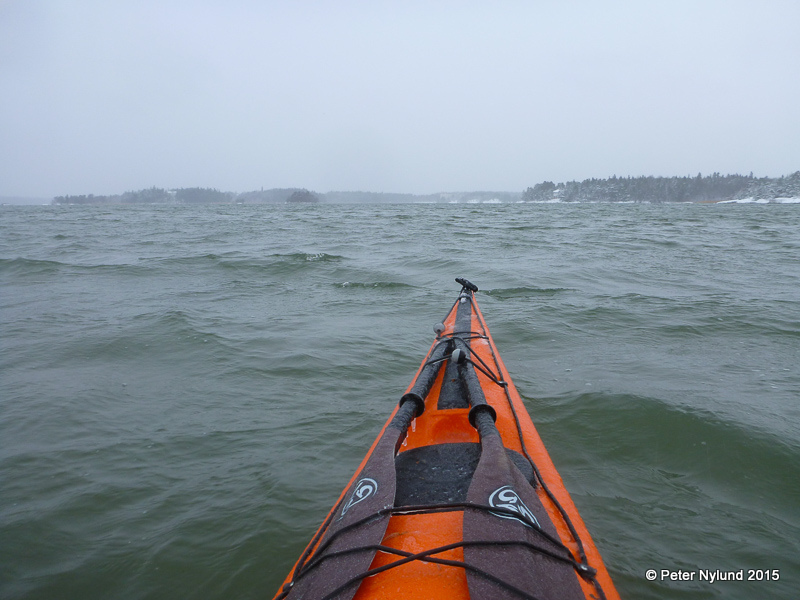 There was still a crossing of little over one kilometer, but with mostly head wind it was safe. 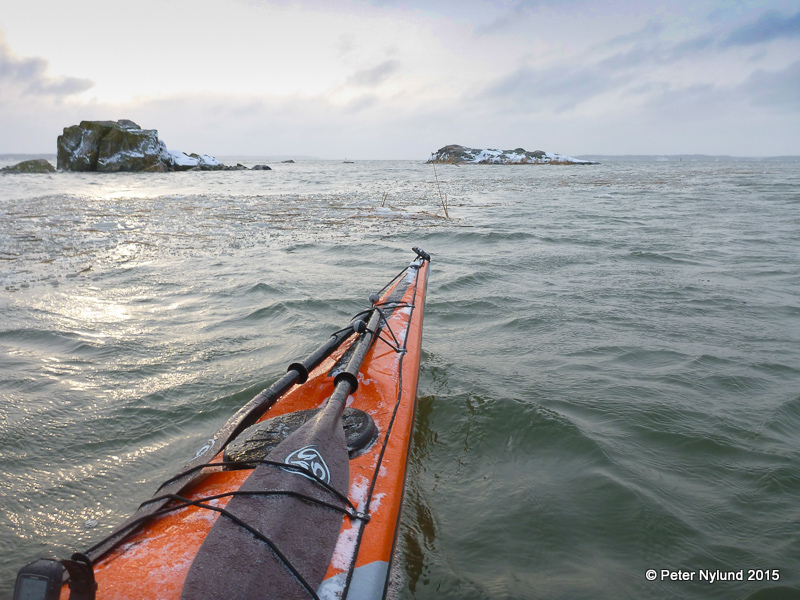 I do feel there is a clear advantage to the Greenland paddle in situations like this one. 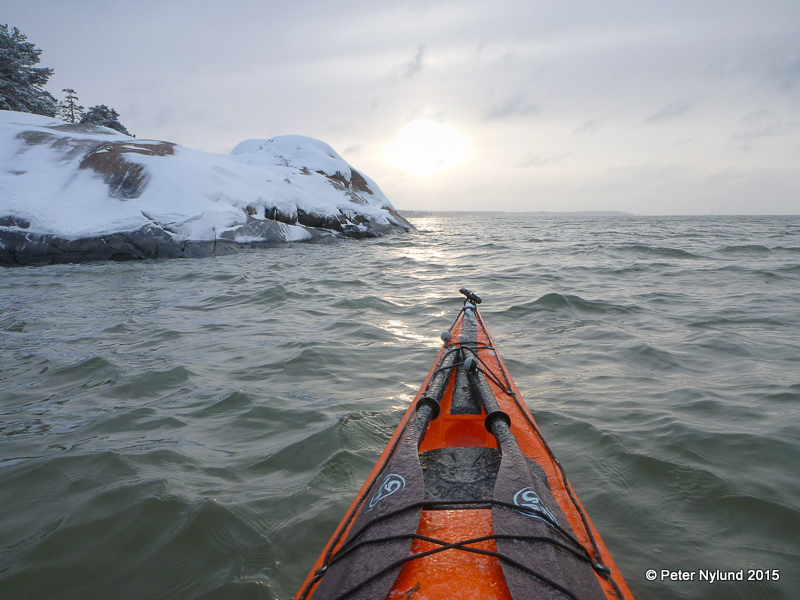 The wind doesn't affect it much and the higher cadence means that paddling against the wind doesn't feel heavy. 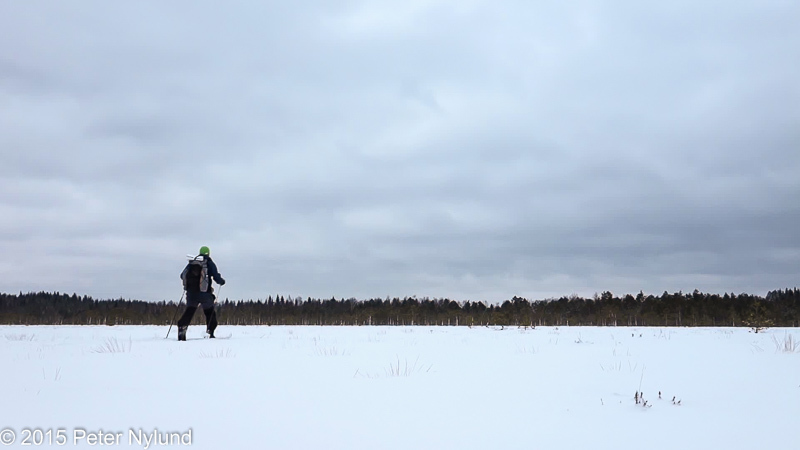 I made about 6,5 km/h against the wind without especially much effort. 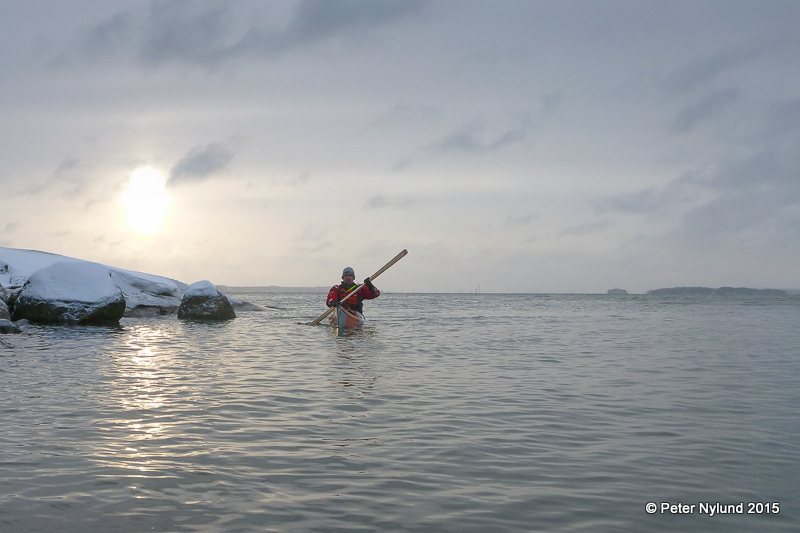 This was a rather short trip, 10 km in two hours, but it was fun nonetheless. 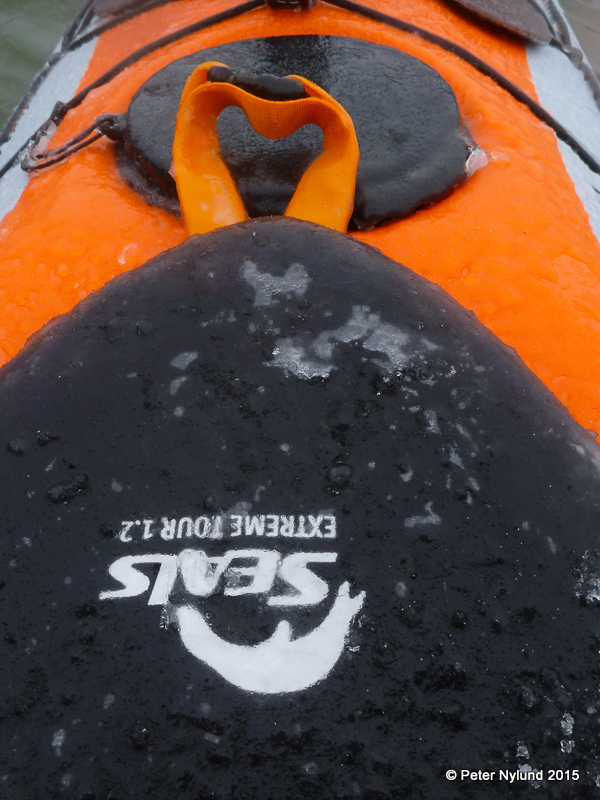 Afterwards the kayak was covered with about five millimeters of ice above the waterline. 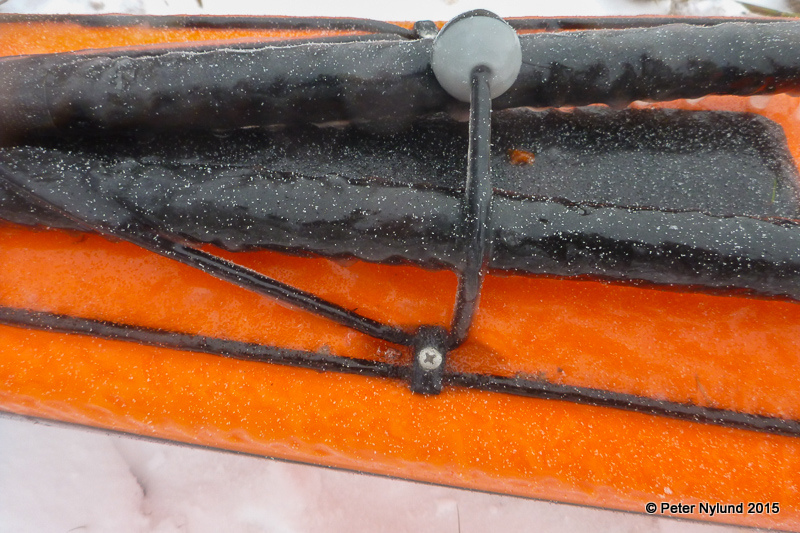 Except for this one, which has a spacer for temporarily putting away the paddle, the grab lines were unusable, since they were under the ice cover. That's it. 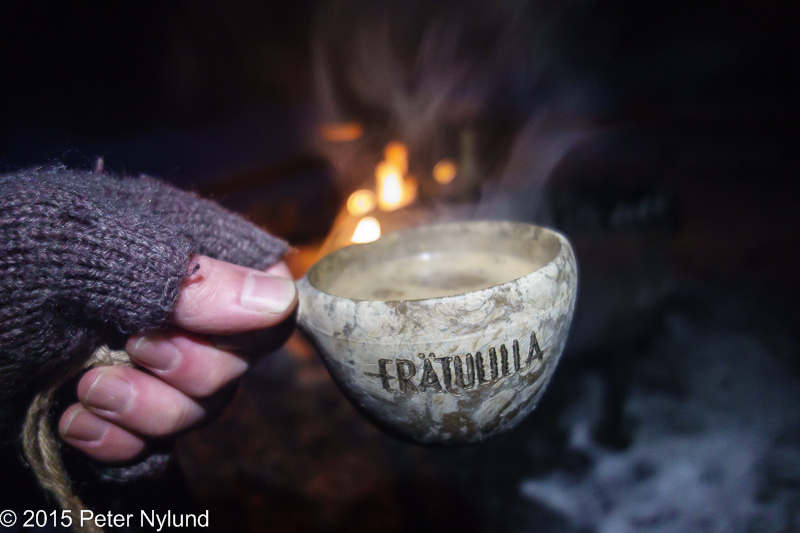 I'm definitely ready to welcome the winter.